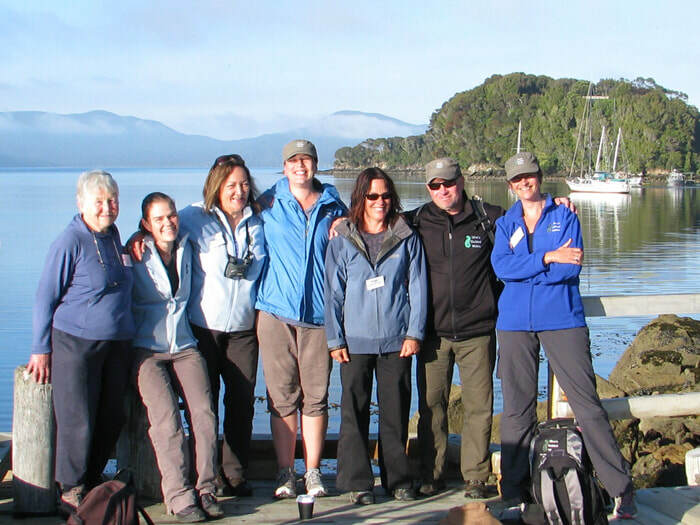 All Ulva’s Guided Walks guides live and work on Stewart Island. 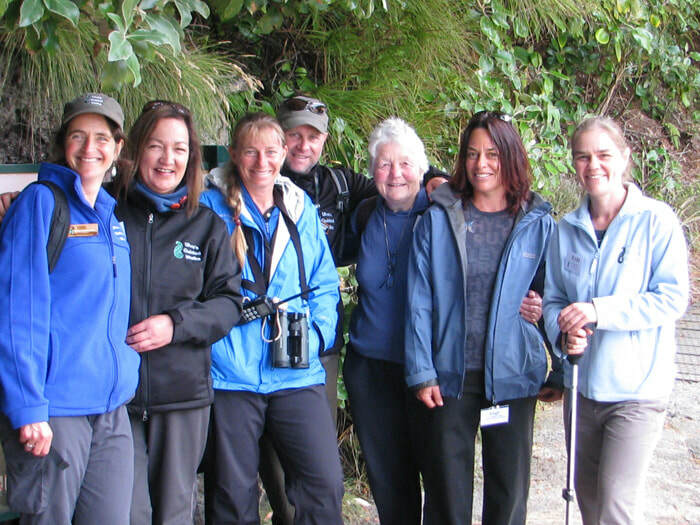 Their local knowledge; flora and fauna, bird and wildlife expertise as well as overseas experiences, are some of the many reasons why we have such a good time guiding. We have books of superstar stories about our guides that go above and beyond for our clients. Visitors need to know that when you are going with Ulva's Guided Walks, you will always receive this same high level of great guiding - every time! 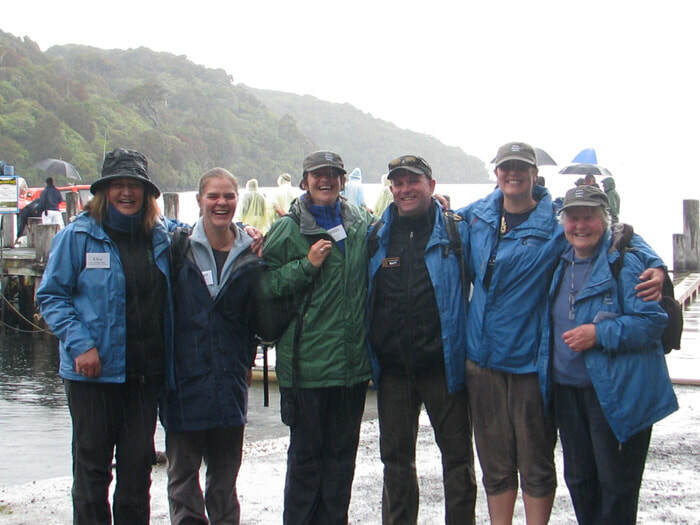 Each one of our guides has their own superb personal story of their Stewart Island life – ask them when you are here....What better introduction to Rakiura (Stewart Island) could you wish for than a guided walk with local Stewart Islanders who have a specialised insider knowledge of the world of Ulva Island Bird Sanctuary? 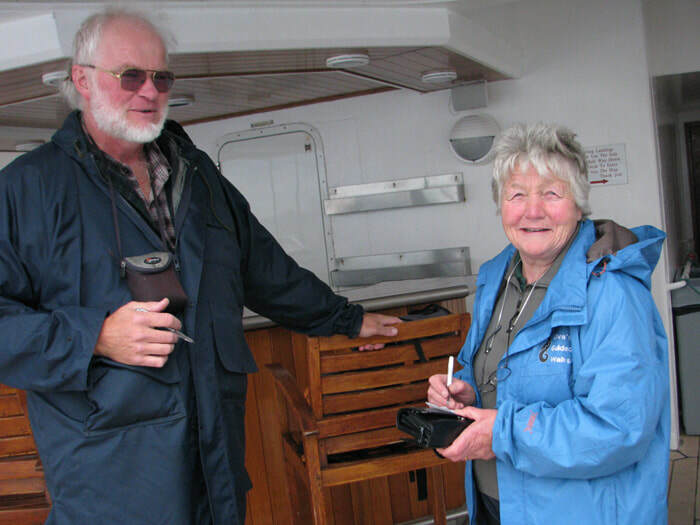 Ulva Goodwillie started Ulva's Guided Walks in 2000 when there was an obvious and requested need for visitors to have guides on Ulva Island Bird Sanctuary. 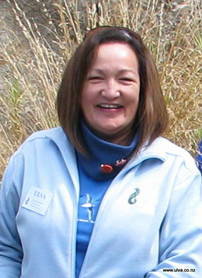 Ulva is an articulate, friendly, well-informed ​Stewart Islander who is passionate about her home and committed to giving visitors a special insight into Rakiura/Stewart Island National Park's unique attractions. Ulva bears the name of the lovely island sanctuary situated in Waka o Te Wera (Paterson Inlet, Stewart Island), also the wildlife sanctuary of Ulva Isle in the Hebrides of Scotland, just off Mull and very near to Iona. A highlight of her walking programme is a leisurely ramble which introduces visitors to Ulva Island's history, scenery and spectacular birdlife. Ulva and her guiding team have an enviable international excellence reputation - they have hosted many film crews and nature/wildlife documentaries. The documentary for World Environment Day in New Zealand, was marketed with Stewart and Ulva Island as best examples of environmental ethics; and was released worldwide. Our clients help Ulva's Guided Walks to support Gadget the Rodent Detector Dog, Stewart Island/Rakiura Community & Environment Trust and the Ulva Island Charitable Trust, who continue to uphold and maintain the highest quality environmental and conservation standards for the Islands in Rakiura/Stewart Island National Park. Ulva was also part of the team instrumental in translocating and releasing of our rare and endangered robins and rifleman to Ulva Island Bird Sanctuary. In October 2013, Ulva had her first book published, Ulva Island - A Visitor's Guide. Filled with 160 pages of stunning colour photographs and Ulva's delightful energy and passion for Ulva Island, this fabulous book will allow easy identification of the unique flora and fauna when strolling along the Island's gravelled pathways. Matt was born in Kent in the south east of England and from a young age had an interest in all wildlife but particularly birds. Early years of birding were spent in his home county but the listing bug soon took a hold and Matt travelled the UK far and wide to get birds on his list, finding a few rarities along the way such as American Robin and Roller. His UK list stands at over 400 birds. He has since travelled extensively around Europe, North America, Asia, Pacific Islands as well as Australia and New Zealand. Highlights of these trips included seeing Tiger in India, Leopard in Sri Lanka and most recently Kagu in New Caledonia. The Kagu was on Matt's "most wanted bird" list and is now on his world list! It was during one of these trips to New Zealand that Stewart Island found its way into his heart and since 2007 is where he calls home. Matt enjoys showing fellow bird watchers the vast variety of seabirds on pelagics, the endemics of Ulva Island, and the iconic kiwi during evening trips. 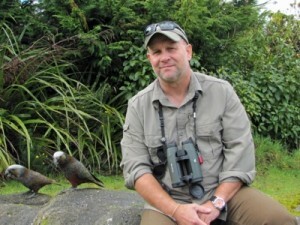 In his spare time, he has volunteered for the Department of Conservation; the Kakapo Recovery Programme on Codfish Island; helping to tag Great White Sharks off Stewart Island; and gathering data for the Southern New Zealand Dotterel project. He volunteers for SIRCET ; Blue Penguin surveys, banding Sooty Shearwaters and Kiwi/Morepork/Weka bird call counts. 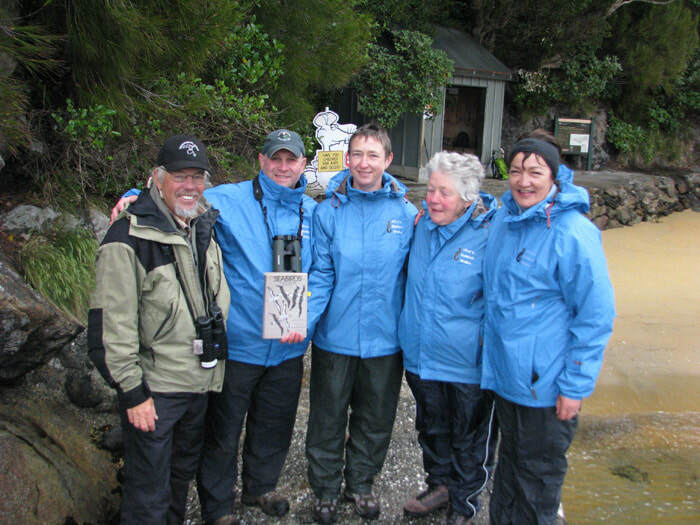 In 2011 Matt became Chairman of the Ulva Island Charitable Trust , a group that (in conjunction with DOC) works towards keeping Ulva Island open to the public, remaining free of introduced pests and predators, and aspiring to be one of New Zealand’s premier bird watching locations. Jules has been a bird watching widow for more than twenty years, which has given her an insight into the minds of bird watchers, listers, twitchers – and their partners! Originally from the UK, Jules was a typical London commuter spending 2-3 hours a day travelling by train to and from corporate life near the River Thames. In her late-thirties, she and partner Matt sold their apartment and embarked on an adventure, fondly referred to as “our mid-life crisis tour; 11 countries in 300 days without a hairdryer”. This ultimately led them to seek a life on Stewart Island, where they have lived and worked since 2007. When she’s not driving a computer, Jules can be found walking her dog at the beach every day and counts herself incredibly fortunate to live among the fabulous Stewart Island community. 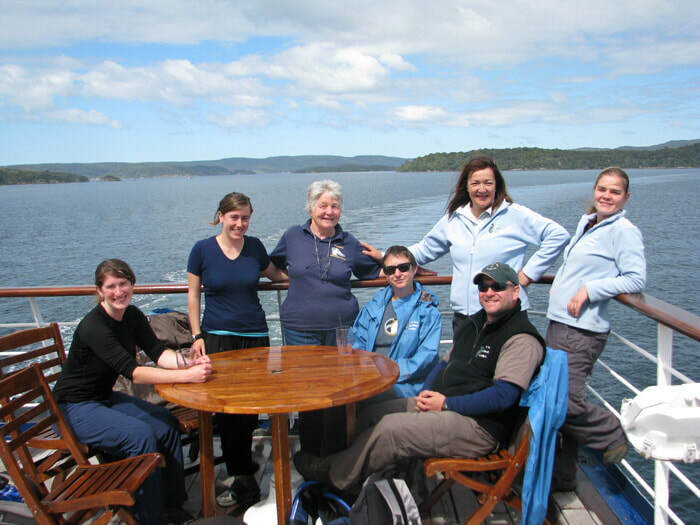 She volunteers for the Ulva Island Charitable Trust and is involved with the promotion of Stewart Island as a visitor destination. Ann offering her autograph to Natural History expert, Lloyd Esler!